In 2003, two bronze plaques were mounted at the entrance of the chemistry and physics building, Corcoran Hall. The plaques were commissioned by then President Stephen Trachtenberg to show more of the rich history of our university. The plaques were composed and written by the then Chair of Physics, William C. Parke. Gamow was invited to GW in 1934 by then GW President Cloyd Hecht Marvin. Marvin wanted to strengthen physics at GW. At first he thought to build an experimental program, but Merle Tuve at the Carnegie Institution convinced him that theorists would be less expensive and so more effective use of the money he had to spend. President Marvin had Gamow and Teller in mind, as he had met them some years before. Gamow agreed to come if there would be funds for a yearly physics conference and if Teller could join him. In 1935, Teller moved into a home on Garfield Street with his wife Mici and began work. His teaching duties were mainly lectures on the new quantum theory. Although he was 27, most of his students were older. A few became research collaborators, including Sterling Hendricks, Ferdinand Brickwedde, and Stephen Brunauer. 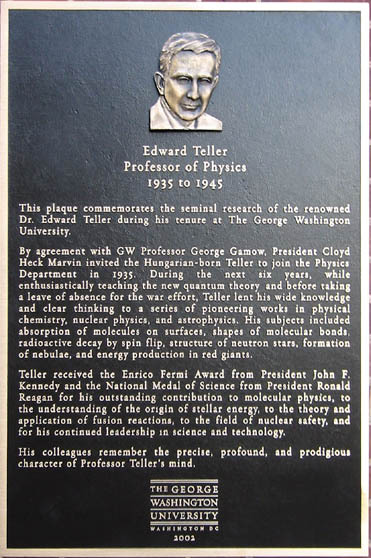 Gamow often engaged Teller with ideas in the world of nuclear physics and astrophysics, but Teller largely remained a chemical physicist during his time at GW, or, as physicist Placzek called him, a “molecule inspector”. Teller received the Enrico Fermi Award from President John F. Kennedy and the National Medal of Science from President Ronald Reagan for his outstanding contribution to molecular physics, to the understanding of the origin of stellar energy, to the theory and application of fusion reactions, to the field of nuclear safety, and for his continued leadership in science and technology. His colleagues remember the precise, profound, and prodigious character of Edward's mind. 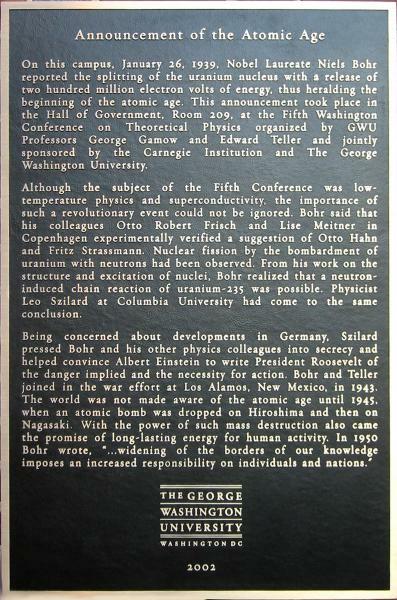 The second plaque describes the announcement of the atomic age, an event which took place on our campus on January 26th, 1939. On that date, Nobel prize winner Niels Bohr reported the splitting of the uranium nucleus. Bohr was attending the Fifth Washington Conference on Theoretical Physics organized by Professors George Gamow and Edward Teller of GWU and by the Carnegie Institution. Professor Gamow later became famous for proposing the big bang theory of the universe, and Teller for his work on the hydrogen bomb.